Did you know each 15 gram portion of Nutella contains two whole hazelnuts, some skimmed milk and cocoa? Two whole hazelnuts? I’m not sure which marketing mogul thought up the line above for Nutella’s latest TV campaign, but to me two hazelnuts doesn’t sound like the biggest step towards a healthy, wholesome breakfast. When I was little we were only allowed Nutella on very special occasions. To be more specific, we were only ever allowed it on holiday in Italy, which my Mum somehow managed to convince my brother and I was the only place you could buy the stuff. And while my littler loaf self looking forward to the future would chastise me for being such a boring old grown up, I’m glad my Mum limited our intake: for all the Ferrero company might dress it up with nutritional advice and fancy ad campaigns, Nutella on toast is essentially eating chocolate for breakfast. And sugar. Lots of sugar. Nowadays my favourite breakfasts tend to rotate between slightly more sensible options – avocado on toast, bircher museli or homemade English muffins – and an occasion to open the Nutella jar is most likely to involve some sort of baking, but that’s not to say I’m not open to trying a new (and much more naughty) spread. Enter Speculoospasta (also known to the Americans as Biscoff Cookie Spread). Made with nearly sixty percent ground up Speculoos biscuits (plus a bit of oil and sugar syrup) it looks like peanut butter, smells like heaven and tastes like creamy cookies, spice and Christmas all rolled into one rich, round mouthful. It also sounds like a heart attack on a plate, but for the purposes of a baking blog I’m absolutely fine with that. I’m not telling you to spread it on your toast every day, just to enjoy it on the odd occasion: a finger full when you’re in need of a pick me up, a late night stolen spoonful from the jar, or something really special like these Speculoos soufflés. Speculoos spread is not readily available in the UK. You can buy it online and pay extortionate shipping fees (often more than the jar itself) and I just today discovered that Le Pain Quotidien sell a version from their various cafés, but otherwise it’s a pretty rare treat. So when the lovely Giulia of Mondomulia offered to bring me some back from Belgium as a present, I knew I needed to make something memorable. After several fingers full had been scooped from the jar by yours truly and an enormous scoop enjoyed by Carnivorous Boyfriend, I set the jar aside and started to work on these soufflés. Having never made a soufflé before, and unsure about where to begin, I ended up adapting this Bon Appetit recipe for peanut butter pastry cream, substituting the spread and leaving out a little sugar. It tasted like Speculoos spread but smoother and creamier and slightly more subtle. So far, so good. On Friday night I made a chocolate soufflé base, dropping a large spoon of Speculoos pastry cream in the middle of each one and baking for around 12 minutes. Excited that they’d risen (albeit a little unevenly) we dove in, unsure of what to expect. To be honest, they weren’t quite right: the middle just the wrong side of runny and the edges tasting ever so slightly of egg, but overall the chocolate and Speculoos spice shone through and we had no trouble polishing them off. The next morning I set to work on adapting the recipe, using my batch of Speculoos pastry cream as a base. The chocolate had been a bit overpowering in the previous incarnation and the middle undercooked, so I decided to make my soufflés using only the pastry cream and a little beaten egg white and sugar. Using David Lebovitz’s recipe for Chocolate Caramel Soufflés, I lined my ramekins with butter and granulated sugar, chopped milk chocolate, folded in fluffy egg whites and into the oven they went. And I’m really pleased with the results. They rose a little higher than I was able to catch on camera – perhaps not the towering works of art you see in restaurants but enough to justify their ‘puffed up’ name – and sugar and salt sprinkled at the last minute created a lovely crunchy top. Beneath this golden crown the texture was beautifully light, leading down to a soft and yielding middle tasting of creamy, hot, Speculoos-spiced biscuity goodness. If you’ve never made soufflés before, this might not be the most sensible place to start, but it’s a seriously delicious one. Served with a scoop of vanilla ice cream, you get an experience that is at once hot and cold, rich and smooth, crunchy and creamy. I’m not going to say it’s good for your waistline, but it’s definitely good for your soul. This is a dessert that will put a smile on your face. Enjoy. Makes 4 soufflés with some pastry cream left over – use to fill éclairs, tart shells or make more soufflés! Bring the milk and cream to a simmer in a medium saucepan. In another bowl, whisk together the egg and egg yolk. Add the sugar, cornflour and flour to eggs and whisk to combine. Gradually whisk the hot milk and cream into the egg mixture, then return to the same saucepan. Bring to the boil, whisking constantly to avoid burning or lumps for one minute then remove from the heat. Whisk the speculoos spread into your hot pastry cream. Strain into a bowl and season with a pinch of salt. Cover with cling film, directly touching the surface of pastry cream to avoid getting a skin. Set aside until ready to use – this pastry cream can be made up to a day before you want to make the soufflés, just make sure it has come back to room temperature before cooking with it. Preheat the oven to 200 degrees C. Grease four ramekins (approx. 125ml volume) with butter. Pour some granulated sugar into each one, tipping to shake out the excess so it coats the sides. Whisk the egg whites in a large clean bowl until frothy. Gradually add the granulated sugar and continue whisking until stiff, glossy peaks form. Fold a quarter of the whipped egg white into your pastry cream to loosen it, then gently fold in the milk chocolate chips. Fold in the rest of the egg whites carefully, making sure you deflate them as little as possible. Under – rather than over – mixing is preferable here so a few little streaks of white are fine. Divide the mixture between the four ramekins and run a palette knife over the top to smooth. Run your thumb round the inner edge of each ramekin, through the soufflé mixture, creating a shallow, even channel as you go. This will help your soufflés to rise evenly. Sprinkle the tops with granulated sugar and a little sea salt (if using), then bake for 10 – 14 minutes. I have to be a little vague here as oven temperatures vary. Mine took a little longer, but it may be because my oven is quite old! Remove from the oven and serve immediately. Split open at the table with very cold ice cream scooped in, this is the dessert that dreams are made of. I didn’t know that, it’s quite impressive really! I really hope I get myself hold of some of this speculoos stuff…That souffle looks absolutely wonderful! What a lovely idea! I’m really intrigued by the sound of speculoos spread…I love the little biscuits! 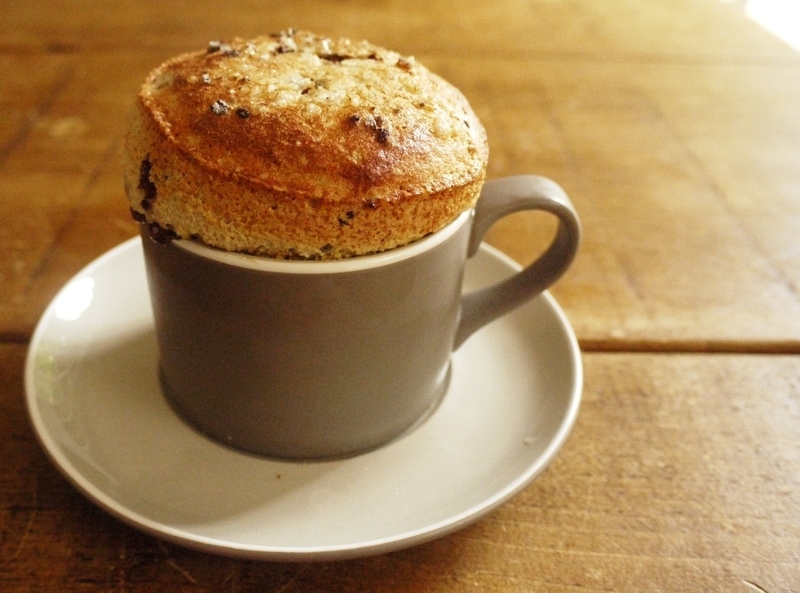 It’s always exciting when you make a souffle and it actually works…one of those real kitchen pride moments! I read somewhere that Ferrero were really worried about any EU requirements to disclose all the ingredients in Nutella on the label because they thought that lots of people would stop buying it in they knew what was (and wasn’t) in it! Last time I was in Bruges, I spent a happy hour browsing a speculoos shop that sold all manner of speculoos goods. No soufflés though and they obviously missed a trick because these look and sound absolutely wonderful! I am very impressed with the amount of rise that you were able to capture on camera so they must have been even more impressive in person. I so want to get some speculoos now! I really must get my paws on some Speculoospasta. I wonder if the LPQ here (actually I don’t even know if there still is a LPQ here!) sells it. 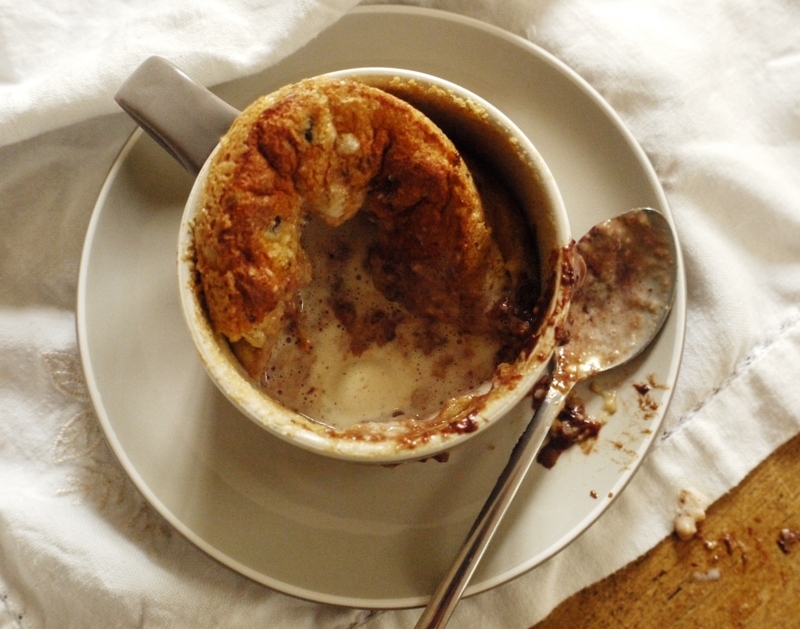 Your souffle sounds like heaven! It looks sooo delicious ! Frugal Feeding – do try to get hold of some, it’s delicious. Elly – I was like a proud mum, it definitely does feel like a great achievement! 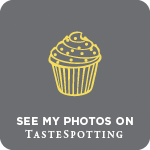 Londonbakes – haha, I can totally believe that. I don’t know why anyone wouldn’t realise it wasn’t healthy though – you just have to taste a spoonful to know it’s rammed full of sugar. Sadia – no, I hadn’t read that. How ridiculous – it’s like people suing McDonalds. Lorraine – thank you. Do try to get hold of some if you can! That souffle is beautiful. I am not a big nutella fan but am not surprised that there are so few hazelnuts in it. I need to make a souffle now. This post has really inspired me. Oh my does that look like decadent deliciousness, or what! Everyone should taste Speculoos spread – it’s amazing! I’m too lazy to use it in cooking: spread on toast is my breakfast of choice at the weekend! 🙂 I knew you would make something special with it! Ps: how does the Pain Quotidien version compare to Lotus? Oh my oh my! This is sooo bookmarked to make! Fabulous! I am not a Nutella fan but have really been dying to buy a jar of the Speculoos cream which I ogle every time I go to the grocery store. I’ll bet it is so much better in a dessert like this than Nutella which I find too sweet. And the souffl”s are just stunning!!! Chef Connie – thank you, and glad to be of inspiration! Giulia – thank you so much for bringing some back. LPQ spread tastes a bit more homemade, and is slightly less smooth, but I think I might actually prefer it. Definitely a good substitute if you’re not going to France or Belgium any time soon! Jamie – thank you 🙂 This speculoos spread is pretty sweet too, but utterly delicious. You definitely need to try. I still can’t get over how well you and your boyfriend (and friends + family) get to eat! These look gorgeous, and I love the chocolate-speculoos flavor. Still have to attempt the souffle. Oh wow. I want one of these so bad right now! Molten hot chocolate – YAY! Oh wow! I’ve only just heard about Speculoos cream and I could hug you for telling me where you can get it as I adore the flavour of the biscuits. I’ve just made Nutella at home (super easy!) and think the next challenge is my first souffle using this recipe! Marissa – it’s baffling how some people don’t realise things about what goes into their food. Madness! Michelle – glad you like them! North South Food – my pleasure. Do get your hands on some, it’s so yummy. It always annoys me that the Nutella commercials try to make it seem like a “healthy” spread. These souffles look amazing! Love that you did a speculoos flavor. This is a great use of Biscoff spread, yummy! I have used it in a savory dish too; a chicken stir-fry with Thai flavors. I’m not sure you could do that with Nutella, haha. Thanks for your always lovely photos and stories. It´s almost funny that someone might think nutella is anything but fattening and delicious, that´s what makes it so addictive! 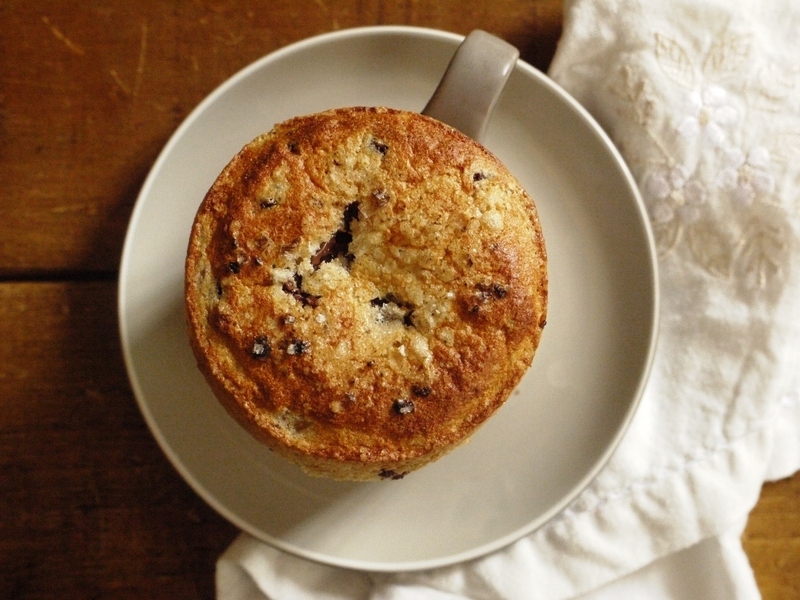 Your souffle is picture perfect, as usual. I’d been reading tweets about Speculoos for a while and wondered what everyone was on about, and now I know! 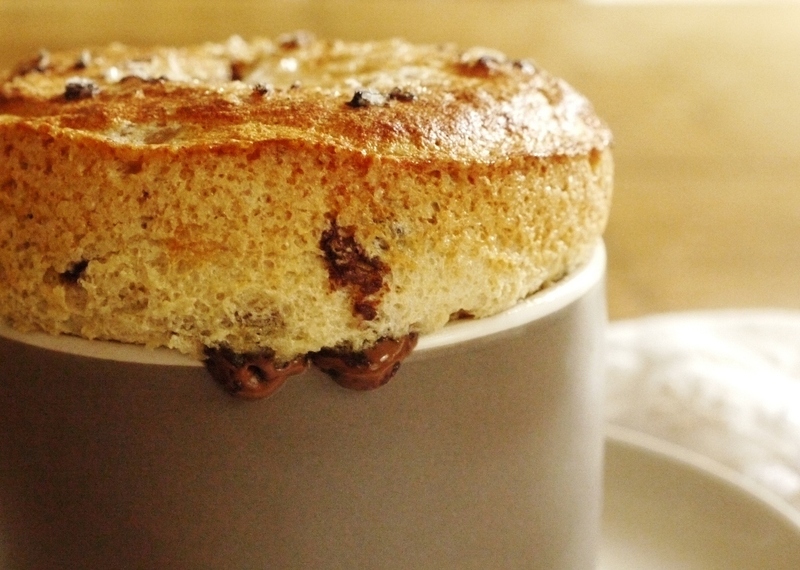 Your souffle looks spectacular. I want one right now! Donna – wow. Not sure I’m ready to try it in anything savoury yet, but very impressed by your experimentation! Vintage Kitchen Notes – aw, thank you. Jennifer – it’s so good. Try to get hold of a jar if you can! I will definitely try it.. Your blog is superb! I found you on bloglovin’ and from now on I’m following you..
Hmm, only 2 hazelnuts? I mean I know it’s not health food but that seems awfully low for a chocolate hazelnut spread. I’m not sure how it ever got passed off as a healthy breakfast option, it’s always been a treat food since I was kid. Daisy – I’m not sure if you can substitute the Nutella directly, so definitely worth experimenting to get the perfect balance. Sylvie – exactly, Nutella is for treats and special occasions only! Jereme’s Kitchen – you’re right, pure gianduja is heaven. And we shouldn’t really be eating Nutella because of the palm oil – definitely good to try subtitutes where possible. I’m always so surprised when I hear people praizing the speculoos spread. As I live in Belgium it has become something “normal”, and it’s even dissapearing from the tables as people just had enough! I love the fact that you made the speculoos paste into something more! We have different brands that make the speculoos spread, I will have to make sure you get to try the one from the small company as Lotus is a very large company. Well done, love this and will make sure people from Belgium visit your blog to recreate this at home! So this is what the souffle question was all about. And what a spectacular result or should I say speculoo result! One day I might get to try some of this stuff, but in the meantime I will just imagine the beatific smile on your face. I remember when nutella first became available in the UK – wow, what a treat it was. But NOT for breakfast – way too sweet. Gorgeous souffles! You had me at speculoos pastry cream! The rise you got is gorgeous! After the chocolate base debacle, you really persevered to get the perfect chocolate and speculoos souffles. I’d love to try these! I make speculoos cookies every Christmas. I enjoy the spread but try to stay away from it. That stuff is dangerous. 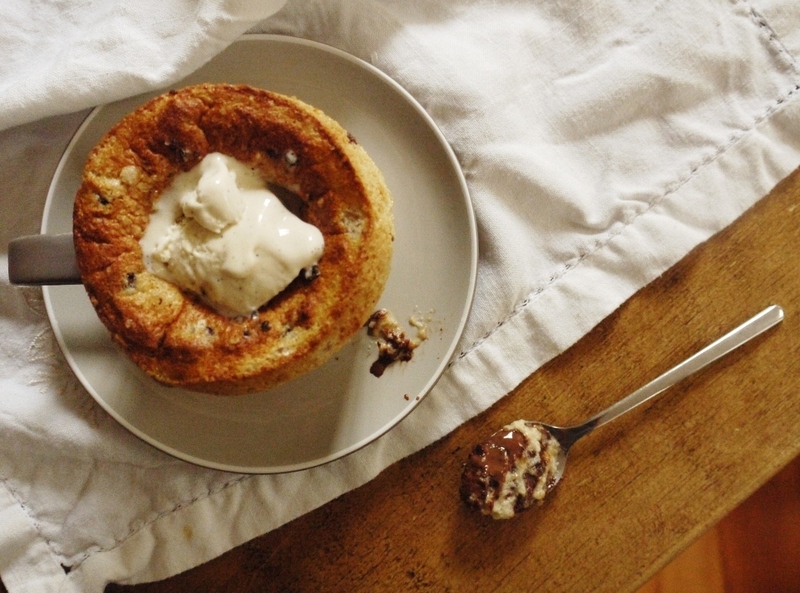 But baked into a beautiful, spiced souffle–well, that’s totally justifiable! Nice job!